Again with the snow? I was not expecting this. Neither were the flowers. But they are hardy, and the snow will pass. I’ve now passed my 4th blogiversary — Happy Blog Day! This prompts a bit of looking back at what I was doing that first month of blogging. In some ways, things are much the same. I still love and wear my handspun alpaca mitts. I still love and make the NYT No-Knead bread. This post, by way, is my most-viewed post. Lotta bread lovers out there. I’m still spinning and dyeing. Spinning much better now, thanks to a couple of classes with the justly-revered Judith MacKenzie. 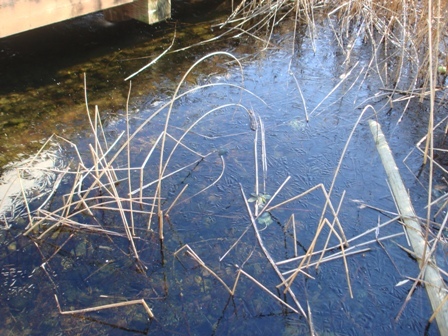 But, although we’ve had our share of wintery weather, there haven’t been any more visits from the river otters. What’s different? Mostly the kids, who don’t show up here too much. My son Erik has graduated college and is navigating the chilly job market while also doing some free-lance writing. Fingers crossed for two projects being printed and available to the public this year (I’ll keep you posted). He’s also part of the writing team on The Mongoliad, a cool on-line serial novel. My daughter Alex continues her studies at Savannah College of Art and Design. She’s a Dramatic Writing major, which means scripts, although her writing teacher this quarter is fine with her working on a novel. These kids, they think one make a living writing! Fools . 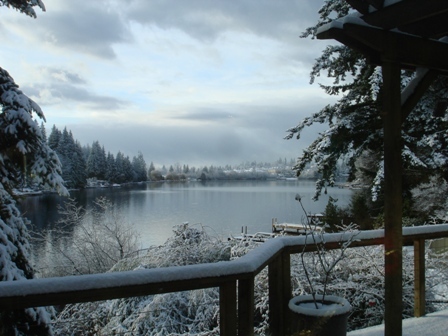 . .
As I mentioned recently, we had a bit of snow. 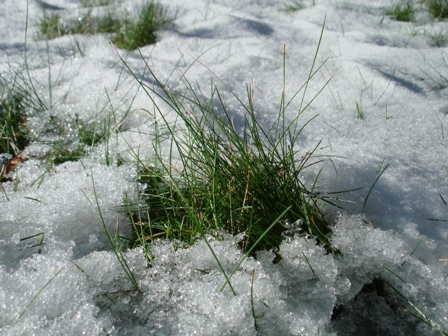 It’s been quite cold since then, so the snow remains in shadier spots. But where the sun has a chance to do its work, green is poking through. but it won’t last. Take this a metaphor for bad times, for the winters of discontent that we go through from time to time. With luck, the sun’ll come out tomorrow. We woke up this morning to find that the promised scattered snow flurries had actually been pretty steady through the night. These pictures are from about 9am. It’s been snowing off and on through the day, but the air is warm enough that the snow is melting slowly, so this is a much of an accumulation as we ever had. 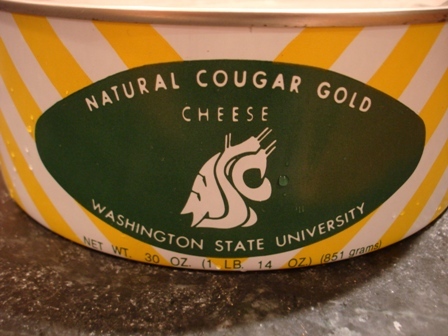 I’ve been enjoying the seasonal delight of aged Cougar Gold Cheese. Every year I buy a new can and slip it under the stack in the fridge, then take the oldest cheese off the top. 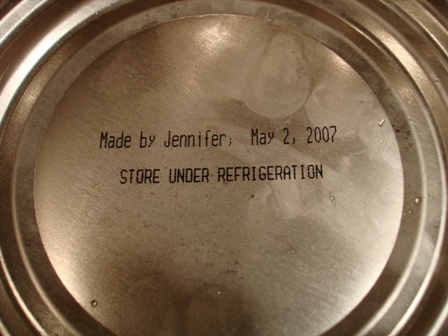 The cheese keep indefinitely as long as it’s in a refrigerated sealed can. I know some WSU students, so I get a fresh delivery hand-carried from Pullman each December. I put another 2 years of age on the cheese, and this year I bought an extra cheese so stretch the aging schedule to 3 years. I was talking with someone at a cheese shop, and she said she had a customer who has a 20 year rotation on their Cougar Gold. That’s dedication! As for me, I can say that Jennifer did good work back in 2007. 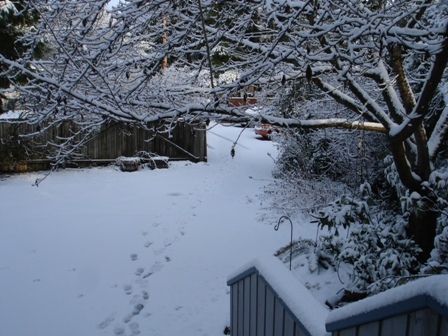 Another Snow Event here in the Puget Sound Area, and I really don’t want to schlep out to get more suet cakes, yet worry about the birds finding enough to eat. My jar o’grease that I keep in the freezer has very little in it, so I decided to make a nutritious goo of peanut butter, rolled oats, and Crisco. I stuffed this into the bird feeder and put it out in cherry tree in the front yard. 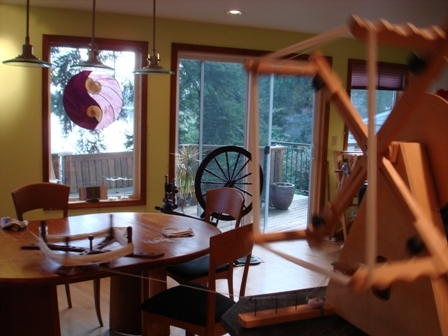 Meanwhile, I’m inside busily dyeing Blue Faced Leicester roving to get ready for the Whidbey Spin-In, April 4 and 5. I’ll have a table on the 5th only. World AIDS Day Fundraiser — with Yarn!